The complexity of the microbial population harbored in oral biofilms around the affected teeth and within the periodontal pockets, combined with the diversity of clinical presentations of periodontitis, has made the identification of specific microbial etiological agents very challenging. The most important gram-negative organisms are Aggregatibacter actinomycetemcomitans (Aa), Porphyromonas gingivalis (Pg), Prevotella intermedia (Pi), Bacteroides forsythus (Bf), Fusobacterium nucleatum (Fn), Capnocytophaga species (C.sp), and Campylobacter rectus (Cr). Each species possesses a large number of virulence factors relevant to the periodontal disease process. Dental plaque bacteria Aggregatibacter actinomycetemcomitans stands out as one of the most powerful periodontopathogens. It is a fastidious, facultative anaerobic, nonmotile, nonhemolytic, nonsporing, small gram-negative rod and is a prominent member of the HACEK group (Haemophilus spp., Aggregatibacter actinomycetemcomitans, Cardiobacterium hominis, Eikenella corrodens, and Kingella kingae) of pathogens. Aggregatibacter actinomycetemcomitans has been implicated as the causative agent of several forms of severe periodontal diseases, including localized juvenile periodontitis (LJP), early-onset periodontitis, and rapidly progressive periodontitis. Authors conducted a comprehensive search through PubMed/Medline databases to compile the available literature till June 2014, for the purpose of detailed insight into the bacteria. The search was designed to identify appropriate articles related to Aggregatibacter actinomycetemcomitans, and the articles were independently screened for eligibility [Figure 1] and [Figure 2]. Aggregatibacter actinomycetemcomitans was first reported in a publication by Klinger in 1912  who termed it as Bacterium actinomycetemcomitans which was changed to Bacterium comitans by Lieske,  and finally to Actinobacilius actinomycetemcomitans by Topley and Wilson. Actinobacillus actinomycetemcomitans is derived from the Greek words, "actes", meaning ray, because of the star-shaped colonies on the agar media and, mycetes, meaning fungus, because Actinomyces was originally thought to be a fungus. The Latin word, 'comitans', meaning in common with, or accompanying Actinomycetes species, reflects the association of Actinobacillus with Actinomycetes. Kilian and Schiott  were the first to demonstrate that Aggregatibacter actinomycetemcomitans was present in dental plaque. With respect to periodontal disease, it was first implicated as the cause of juvenile periodontitis in 1976 by Newman et al.,  and Slots. This disease is now called localized aggressive periodontitis (LAP). There are several lines of clinical evidence that support the association of Aggregatibacter actinomycetemcomitans with LAP. First, the organism is found more frequently in samples obtained from subjects with LAP as compared to healthy subjects. Second, subjects with LAP were consistently found to have elevated serum and locally produced antibody titers to Aggregatibacter actinomycetemcomitans. Third, several studies indicated that the treatment of subjects with LAP with the intention of reducing Aggregatibacter actinomycetemcomitans to undetectable levels resulted in marked clinical improvement, while a lack of clinical improvement was found to correlate with a failure to significantly reduce the level of Aggregatibacter actinomycetemcomitans [Figure 3]. Actinobacillus actinomycetemcomitans is a member of the genus Actinobacillus that belongs to the family Pasteurellaceae. Phylogenetic analysis of the three Pasteurellaceae genera; Actinobacillus, Haemophilus, and Pasteurella; based on 16S rRNA gene sequences, revealed that Actinobacillus actinomycetemcomitans is closely related to Haemophilus aphrophilus and Haemophilus paraaphrophilus and that these three species together with Haemophilus segnis formed a single phylogenetic cluster. Due to their phylogeny and their typical phenotypic characteristics - the autoaggregation, the species Actinobacillus actinomycetemcomitans, Haemophilus aphrophilus, Haemophilus paraaphrophilus and Haemophilus segnis were recently reclassified to a novel genus "Aggregatibacter" by Norskov-Lauritsen and Kilian  [Figure 4]. Cell surface entities mediating adherence include fimbriae, extracellular amorphous material, and extracellular vesicles. Fimbriae - Also referred to as "attachment pili". Location - They are long filamentous polymeric protein structures that can be found projecting from the external surfaces of many gram-negative bacteria. Mechanism of virulence - Fimbriae carry curlin proteins and adhesins which attach them to the substratum so that the bacteria can withstand shear forces and obtain nutrients. Recently, it was reported that the most abundant protein in a fimbria preparation of Aggregatibacter actinomycetemcomitans 304 was a protein with a molecular mass of 6.5 kDa termed Flp, exhibits some amino acid sequence similarity to type-IV pilin. Strains possessing fimbriae adhere three- to fourfold better than non-fimbriated variants of Aggregatibacter actinomycetemcomitans. Location - A bleb-like structure which are LPS in nature, originate from and are continuous with the outer membrane. Structure and composition - Enclosed by lipid bilayer, vesicles can form naturally, for example, during endocytosis. Alternatively, they may be prepared artificially, in which case they are called liposomes. If there is only one phospholipid bilayer, they are called unilamellar vesicles; otherwise they are called multilamellar. Mechanism of virulence - Vesicles are involved in metabolism, transport, buoyancy control, and enzyme storage. They can also act as chemical reaction chambers. 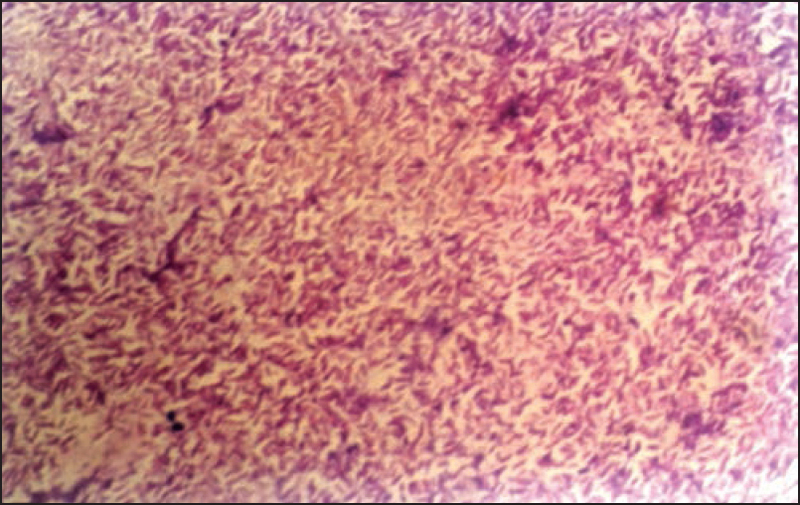 Location - Associated with the surface of Aggregatibacter actinomycetemcomitans cells is an amorphous material that frequently embeds adjacent cells in a matrix. Location - Invasion of Aggregatibacter actinomycetemcomitans is a rapid mechanism involving the formation of cell-surface "craters" or apertures with lip-like rims. These invasins occur as indentations on the cell surface, as well as in membrane ruffles where they appear to be entering into the epithelial cells. Location - Bacteriocins are HYPERLINK "http://en.wikipedia.org/wiki/Toxin" \o "Toxin" toxins produced by HYPERLINK "http://en.wikipedia.org/wiki/Bacteria" \o "Bacteria" bacteria to inhibit the growth of closely related bacterial strains. In Aggregatibacter actinomycetemcomitans they are usually associated with both the bacterial cell surface and extracellular vesicles. Structure and composition - Bacteriocins are a heterogeneous group of particles with different morphological and biochemical entities. They range from a simple protein to a high molecular weight complex of proteins. Antibiotic resistance is a form of HYPERLINK "http://en.wikipedia.org/wiki/Drug_resistance" \o "Drug resistance" drug resistance whereby some subpopulations of a HYPERLINK "http://en.wikipedia.org/wiki/Microorganism" \o "Microorganism" microorganism, are able to survive after exposure to one or more HYPERLINK "http://en.wikipedia.org/wiki/Antibiotic" \o "Antibiotic" antibiotics. One of the most studied virulence factors of Aggregatibacter actinomycetemcomitans is leukotoxin. This toxin is a 116 kDa protein produced by 56% of strains isolated from LJP patients. Location - It is a proteinaceous toxin secreted from the cell membrane of Aggregatibacter actinomycetemcomitans. Structure and composition - Leukotoxin is a member of the RTX family of toxins that produce pore-forming hemolysins. The leukotoxin operon consists of four coding genes designated ltxC, ltxA, ltxB, and ltxD and an upstream promoter gene. ltxA encodes the structure of the toxin. ltxC encodes for components required for posttranslational acylation of the toxin. ltxB and ltxD encodes for transport of the toxin to the bacterial outer membrane. Mechanism of virulence - Leukotoxin is not only species-specific but also cell-specific. The toxin binds to neutrophils, monocytes, and a subset of lymphocytes; and forms pores in the membranes of these target cells overwhelming their ability to sustain osmotic homeostasis, resulting in cell death. Interaction with polymorphonuclear leukocytes (PMNs) - Leukotoxin has shown to efficiently cause death of human PMNs through extracellular release of proteolytic enzymes from both primary and secondary granules, along with activation and release of matrix metalloproteinase-8, which can contribute to periodontal tissue destruction. Interaction with lymphocytes - The ability of leukotoxin to induce apoptosis in lymphocytes might impair the acquired immune response of periodontal infections. A shift in the balance between Th-1 and Th-2 subsets of T-cells is found in periodontal inflammation, with the Th-2 cells to associate with chronic periodontitis. Its ability to affect the lymphocytes also indicates a possible role of this molecule in Th-1/Th-2/Th-17 differentiation, important in inflammatory pathogenesis. 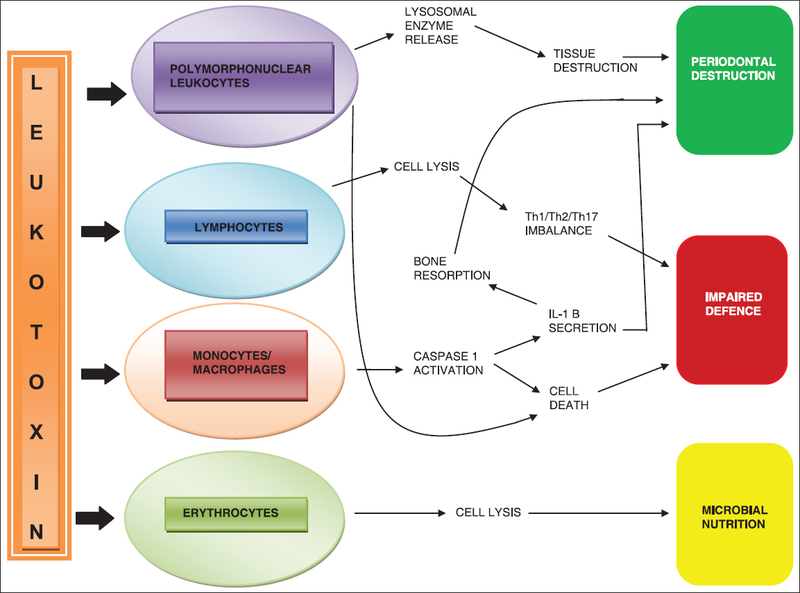 Interaction with monocytes/macrophages - Leukotoxin causes the activation of caspase-1, which is a cytosolic cysteine proteinase that specifically induces activation and secretion of the proinflammatory cytokines interleukin-1β and 18, which result in monocyte/macrophage lysis by incorporation in a cytosolic multimer complex named the inflammasome [Figure 5]. LPSs are large molecules consisting of a lipid and a polysaccharide joined by a covalent bond. Location - They are found in the outer membrane of gram-negative bacteria, act as endotoxins, and elicit strong immune responses in animals. O antigen - A repetitive HYPERLINK "http://en.wikipedia.org/wiki/Glycan" \o "Glycan" glycan HYPERLINK "http://en.wikipedia.org/wiki/Polymer" \o "Polymer" polymer is attached to the core oligosaccharide, comprising the outermost domain of the LPS molecule. Mechanism of virulence - O antigen is the basis of antigenic variation among many gram-negative pathogens which guarantees the existence of multiple serotypes. Core oligosaccharide - The core domain contains an oligosaccharide component that attaches directly to HYPERLINK "http://en.wikipedia.org/wiki/Lipid_A" \o "Lipid A" lipid A and commonly contains HYPERLINK "http://en.wikipedia.org/wiki/Sugar" \o "Sugar" sugars. Mechanism of virulence - It can allow organisms to adhere to epithelial tissues and provide protection from damaging reactions with antibody and complements. Lipid A - It is a HYPERLINK "http://en.wikipedia.org/wiki/Phosphorylated" \o "Phosphorylated" phosphorylated HYPERLINK "http://en.wikipedia.org/wiki/Glucosamine" \o "Glucosamine" glucosamine HYPERLINK "http://en.wikipedia.org/wiki/Disaccharide" \o "Disaccharide" disaccharide decorated with multiple HYPERLINK "http://en.wikipedia.org/wiki/Fatty_acids" \o "Fatty acids" fatty acids. Location - CDT is a cell cycle-modulatory protein with immunosuppressive function. The toxin is either secreted freely or associated with the membrane of the producing bacteria. Structure and composition - CDT is a tripartite structure encoded by a locus of three genes, cdtABC. The toxin itself is encoded by cdtB, while cdtA and cdtC appear to encode proteins that mediate interaction between the CDT complex and the host cell surface. Location - Fc binding proteins are found to be associated with the bacterial cell surface and are released in soluble form during bacterial growth. Structure - One of the protein sequence exhibits significant homology with the N termini of outer membrane protein A (OmpA) of Escherichia More Details coli and related OmpA-like proteins from other gram-negative bacteria. Location - Aggregatibacter actinomycetemcomitans surface associated material produces heat-labile cytotoxins which inhibit human fibroblast proliferation. Location - Certain HSPs have been found in the surface-associated material that are molecular HYPERLINK "http://en.wikipedia.org/wiki/Chaperone_(protein)" \o "Chaperone (protein)" chaperones and play a critical role in protein folding, intracellular trafficking of proteins, and coping with proteins denatured by heat and other stresses. Slots and Ting  had reviewed the effectiveness of various therapies to suppress or remove subgingival Aggregatibacter actinomycetemcomitans. Scaling and root planing alone was unable to remove Aggregatibacter actinomycetemcomitans from LJP lesions and periodontal surgery also often fails to control subgingival Aggregatibacter actinomycetemcomitans effectively. Modified Widman flap surgery may suppress Aggregatibacter actinomycetemcomitans to below detectable levels in about 50% of LJP lesions and may be even less effective in adult periodontitis lesions. Some studies have however indicated that apically positioned flap surgery or gingivectomy is capable of controlling subgingival Aggregatibacter actinomycetemcomitans. 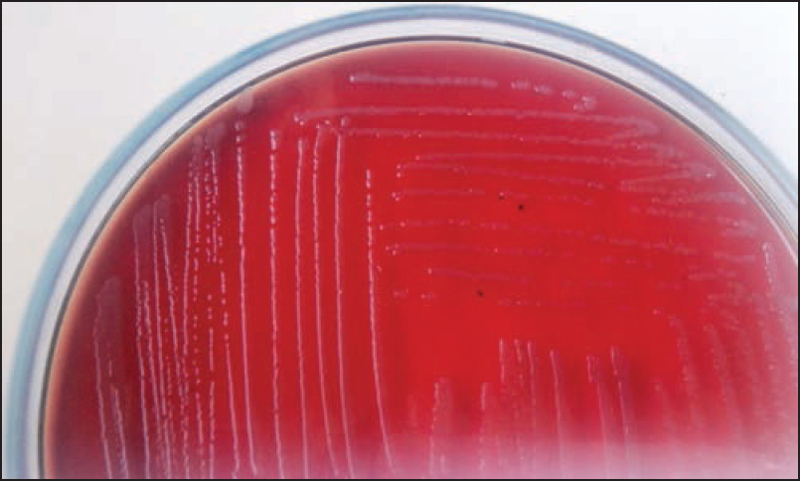 Tetracycline has been used for periodontal infections, but lacks bactericidal activity for most strains and the clinical response has been variable. Systemic use of amoxicillin and metronidazole has been effective in treating Aggregatibacter actinomycetemcomitans-associated LJP and adult periodontitis and 8 days therapy with 250 mg tid (tds) of amoxicillin and metronidazole is the current recommended (adult dosage) therapy. Azithromycin and clarithromycin have been shown to be more active in vitro, than Erythromycin and synergy has been demonstrated with either ß-lactams or ciprofloxacin in combination with metronidazole or its metabolite. Because of their excellent bactericidal activity against Aggregatibacter actinomycetemcomitans, fluoroquinolones are likely to find a role in the treatment of periodontitis, albeit in combination with antibiotics having activity against anaerobes. More recently local drug delivery and host modulation with subantimicrobial doses of doxycycline are under research for the treatment of LJP. There may be as many as 300-400 different bacterial species which can inhabit the human oral cavity. It is difficult to pinpoint a single of these species as the etiologic agent in a specific periodontal disease, especially since it may not be possible to fulfill the classic criteria for a bacterial pathogen as formulated by Koch. However, data originating from the microbiologic, immunologic, histopathologic studies, etc., indicate that Aggregatibacter actinomycetemcomitans is important in the etiology of LJP. Aggregatibacter actinomycetemcomitans is a bacterium with an array of diverse potential virulence characteristics, including multiple immune evasion mechanisms, any one of which may play a crucial role in the local tissue pathology of LAP. Our understanding of this organism still lags behind that of enteric pathogens, largely because methods for genetic manipulation have only just become available. We live in exciting times, where the rapid development of high-throughput technologies such as parallel DNA sequencing, proteomics, metabolomics, transcriptomics, etc., through which the discovery and exploration of the molecular genomics of Aggregatibacter actinomycetemcomitans is being carried out in order to provide more insight into the evolution of the association between the bacteria and their hosts, so as to aid in the prevention and treatment of destructive periodontal disease. Henderson B, Ward JM, Ready D. Aggregatibacter (Actinobacillus) actinomycetemcomitans: A triple AFNx01 periodontopathogen. Periodontol 2000 2010;54:78-105. Slots J, Ting M. Actinobacillus actinomycetemcomitans and Porphyromonas gingivalis in human periodontal disease: Occurrence and treatment. Periodontol 2000 1999;20:82-121. Klinger R. Studies on human actinomycosis Centralblat Bacteriol 1912;62:191-200. Lieske R. Morphology and Blologle of the Strahlenpllze. Leipzig, GDR: Borntraeger 1921;1:415. Topley WW, Wilson GS. The principles of bacteriology and immunity. London: Edward Arnold and Co. 1929;1:1-587. Fine DH, Kaplan KB, Kachlany SC, Schreiner HC. How we got attached to Actinobacillus actinomycetemcomitans: A model for infectious diseases. Periodontol 2000 2006;42:114-57. Kilian M, Schiott C. Haemophila and related species in the human oral cavity. Arch Oral Biol 1975;20:791-6. Newman MG, Socransky SS, Savitt ED, Propas DA, Crawford A. Studies of the microbiology of periodontosis. J Periodontol 1976;47:373-9. Slots J. The predominant cultivable organisms in juvenile periodontitis. Scand J Dent Res 1976;84:1-10. Olsen I, Shah HN, Gharbia SE. 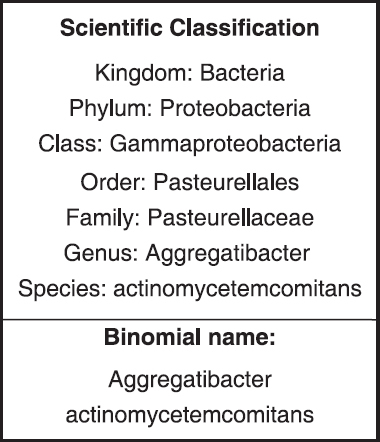 Taxonomy and biochemical characteristics of Actinobacillus actinomycetemcomitans and Porphyromonas gingivalis. Periodontol 2000 1999;20:14-52. Norskov-Lauritsen, Kilian M. Reclassification of Actinobacillus actinomycetemcomitans, Haemophilus aphrophilus, Haemophilus paraphrophilus and Haemophilus segnis as Aggregatibacter actinomycetemcomitans gen. nov., comb. nov., Aggregatibacter aphrophilus comb. nov. and Aggregatibacter segnis comb. nov., and emended description of Aggregatibacter aphrophilus to include V factor - dependant and V - factor independent isolates. Int J Syst Evol Microbiol 2006;56:2135-46. Zambon JJ, Slots J, Genco RJ. Serology of oral Actinobacillus actinomycetemcomitans and serotype distribution in human periodontal disease. Infect Immun 1983;41:19-27. Saarela M, Asikainen S, Alaluusua S, Pyhälä L, Lai CH, Jousimies-Somer H. Frequency and stability of mono- or poly-infection by Actinobacillus actinomycetemcomitans serotypes a, b, c, d or e. Oral Microbiol Immunol 1992;7:277-9. Kaplan JB, Perry MB, MacLean LL, Furgang D, Wilson ME, Fine DH. Structural and genetic analyses of O polysaccharide from Actinobacillus actinomycetemcomitans serotype f. Infect Immun 2001;69:5375-84. Takada K, Saito M, Tsuzukibashi O, Kawashima Y, Ishida S, Hirasawa M. Characterization of a new serotype g isolate of Aggregatibacter actinomycetemcomitans. Mol Oral Microbiol 2010;25:200-6. Brown SA, Whiteley M. A novel exclusion mechanism for carbon resource partitioning in Aggregatibacter actinomycetemcomitans. J Bacteriol 2007;189:6407-14. Ramsey MM, Whiteley M. Polymicrobial interactions stimulate resistance to host innate immunity through metabolite perception. Proc Natl Acad Sci U S A 2009;106:1578-83. Meyer DH, Fives-Taylor PM. Characteristics of adherence of Actinobacillus actinomycetemcomitans to epithelial cells. Infect Immun 1994;62:928-35. Rosan B, Slots J, Lamont RJ, Listgarten MA, Nelson GM. Actinobacillus actinomycetemcomitans fimbriae. Oral Microbiol Immunol 1988;3:58-63. Inouye T, Tanimoto I, Ohta H, Kato K, Murayama Y, Fukui K. Molecular characterization of low-molecular-weight component protein, Flp, in Actinobacillus actinomycetemcomitans fimbriae. Microbiol Immunol 1998;42:253-8. Nowotny A, Behling UH, Hammond B, Lai CH, Listgarten M, Pham PH, et al. Release of toxic microvesicles by Actinobacillus actinomycetemcomitans. Infect Immun 1982;37:151-4. Fives-Taylor P, Meyer D, Mintz K. Characteristics of Actinobacillus actinomycetemcomitans invasion of and adhesion to cultured epithelial cells. Adv Dent Res 1995;9:55-62. Lamont R, Yilmaz O. In or out: The invasiveness of oral bacteria. Periodontol 2000 2002;30:61-9. Stevens RH, Lillard SE, Hammond BF. Purification and biochemical properties of a bacteriocin from Actinobacillus actinomycetemcomitans. Infect Immun 1987;55:692-7. Walker CB, Pappas JD, Tyler KZ, Cohen S, Gordon JM. Antibiotic susceptibilities of periodontal bacteria. In vitro susceptibilities to eight antimicrobial agents. J Periodontol 1985;56:s67-74. Zambon JJ, DeLuca C, Slots J, Genco RJ. Studies of leukotoxin from Actinobacillus actinomycetemcomitans using the promyelocytic RL-60 cell line. Infect Immun 1983;40:205-12. Schreiner H, Li Y, Cline J, Tsiagbe VK, Fine DH. A Comparison of Aggregatibacter actinomycetemcomitans (Aa) virulence traits in a rat model for periodontal disease. PLos One 2013;8:e69382. Johansson A. Aggregatibacter actinomycetemcomitans Leukotoxin: A powerful tool with capacity to cause imbalance in the host inflammatory response. Toxins (Basel) 2011;3:242-59. Todar K. Todar′s online textbook of bacteriology. Available from: http://www.textbookofbacteriology.net/17/11/2014. Saglie FR, Simon K, Merrill J, Koeffler HP. Lipopolysaccharide from Actinobacillus actinomycetemcomitans stimulates macrophages to produce interleukin - 1 and tumor necrosis factor mRNA and protein. Oral Microbiol Immunol 1990;5:256-62. Van Dyke TE, Bartholomew E, Genco RJ, Slots J, Levine MJ. Inhibition of neutrophil chemotaxis by soluble bacterial products. J Periodontol 1982;53:502-8. Ando-Suguimoto ES, da Silva MP, Kawamoto D, Chen C, DiRienzo JM, Mayer MP. The cytolethal distending toxin of Aggregatibacter actinomycetemcomitans inhibits macrophage phagocytosis and subverts cytokine production. Cytokine 2014;66:46-53. DiRienzo JM. Breaking the gingival epithelial barrier: Role of the Aggregatibacter actinomycetemcomitans cytolethal distending toxin in oral infectious disease. Cells 2014;3:476-99. Saiki K, Gomi T, Konishi K. Deletion and purification studies to elucidate the structure of the Actinobacillus actinomycetemcomitans cytolethal distending toxin. J Biochem 2004;136:335-42. Rabie G, Lally ET, Shenker BJ. Immunosuppressive properties of Actinobacillus actinomycetemcomitans leukotoxin. Infect Immun 1988;56:122-7. Letzelter C, Croute F, Pianezzi B, Roques C, Soleilhavoup JP. Supernatant cytotoxicity and proteolytic activity of selected oral bacteria against human gingival fibroblasts in vitro. Arch Oral Biol 1998;43:15-23. Mayer MP, Bueno LC, DiRienzo JM. Cytolethal distending toxin (CDT) of Actinobacillus actinomycetemcomitans. J Dent Res 1998;776-80. Schett G, Metzler B, Kleindienst R, Moschen I, Hattmannsdorfer R, Wolf H, et al. Salivary anti-hsp65 antibodies as a diagnostic marker for gingivitis and a possible link to atherosclerosis. Int Arch Allergy Immunol 1997;114:246-50. Lawson DA, Meyer TF. Biochemical characterization of Porphyromonas (Bacteroides) gingivalis collagenase. Infect Immun 1992;60:1524-9. Fives-Taylor PM, Meyer DH, Mintz KP, Brissette C. Virulence factors of Actinobacillus actinomycetemcomitans: Periodontol 2000 1999;20:136-67. Jain R, Mittal K, Kapoor S. Virulence factors of Aggregatibacter actinomycetemcomitans - A review. J Pharm Biomed Sci 2013;34:1693-8. Nieminen A, Asikainen S, Torkko H, Kari K, Uitto VJ, Saxen L. Value of some laboratory and clinical measurements in the treatment plan for advanced periodontitis. J Clin Periodontol 1996;23:572-81. Pavieic MJ, van Winkelhoff AJ, Pavieit-Ternming A, de Graaff J. Metronidazole susceptibility factors in Actinobacillus actinomycetemcomitans. J Antimicrob Chemother 1995;35:263-9. Harano K, Yamanaka A, Okuda K. An antiserum to a synthetic fimbrial peptide of Actinobacillus actinomycetemcomitans blocked adhesion of the microorganism. FEMS Microbiol Lett 1995;130:279-85. Takamatsu MN, Yamaguchi N, Kawasaki M, Yamashita Y, Takehara T, Koga T. Immunogenicity of Actinobacillus actinomycetemcomitans serotype b-specific polysaccharide-protein conjugate. Oral Microbiol Immunol 1996;11:220-5. Hermlnajeng E, Asmara W, Yuswanto A, Barid I, Sosroseno W. Protective humoral immunity induced by surface-associated material from Actinobacillus actinomycetemcomitans in mice. Microbes Infect 2001;3:997-1003.